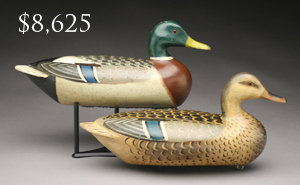 Guyette & Deeter conducted their annual summer decoy auction on July 29 & 30 at the Sheraton Harborside Hotel in Portsmouth, New Hampshire. 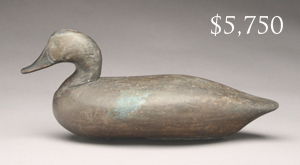 It was accompanied by a 50 table Buy, Sell, & Swap. 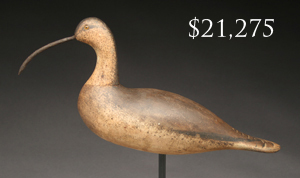 The auction grossed $2.2 million, which was at mid estimate. 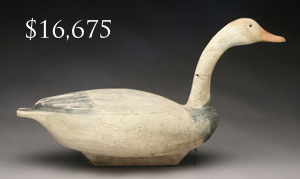 There were 108 registered bidders in the audience, 171 phone and absentee bidders, and 734 registered online bidders. 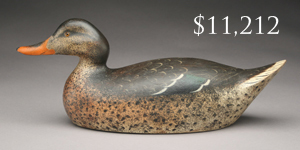 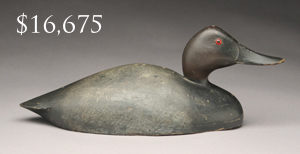 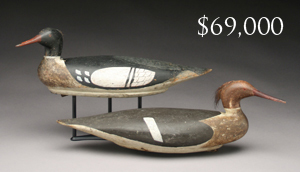 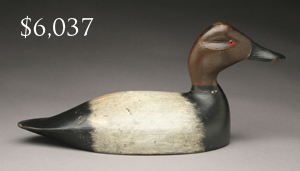 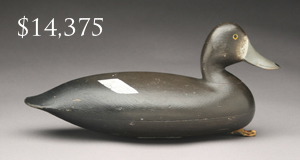 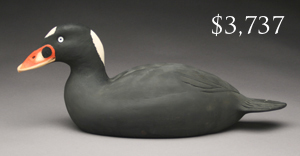 Bidding battles for key decoys erupted continually as many items sold over estimate. 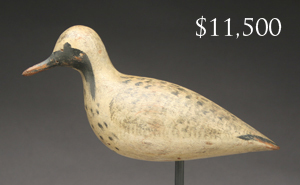 3 lots sold for over $100,000 and 39 lots sold for over $10,000. 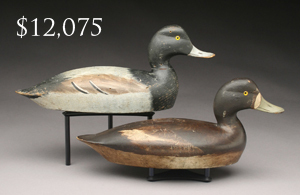 Because of Guyette & Deeter's long history of accurate guaranteed condition reports and responsible estimates, the number of sales to non audience bidders continues to rise at our sales. 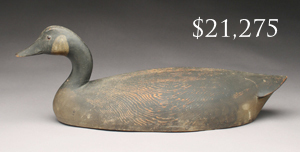 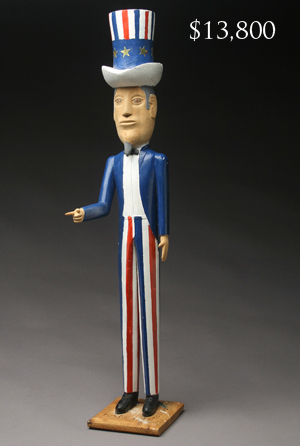 11% of the auction gross sold to internet bidders and 50% sold to phone and absentee bidders. 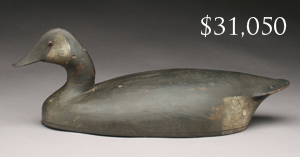 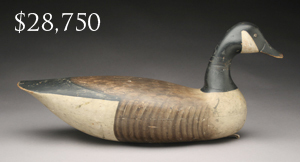 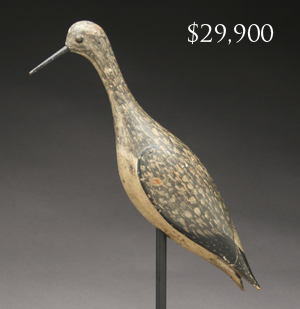 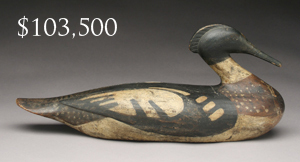 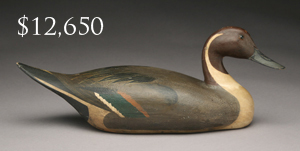 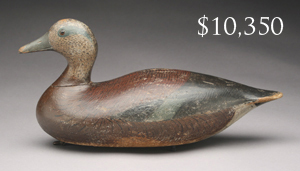 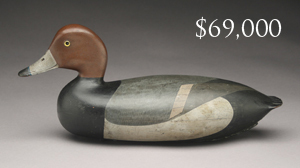 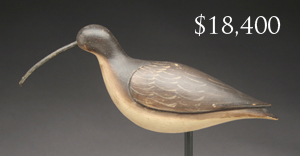 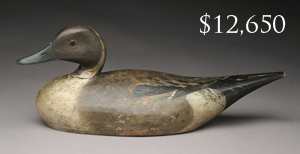 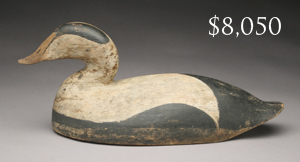 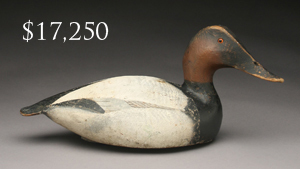 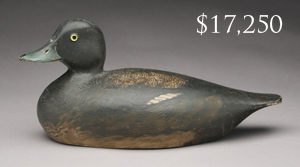 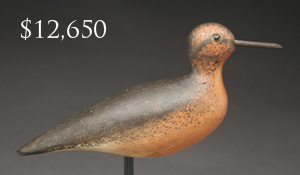 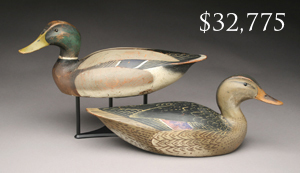 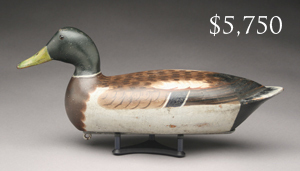 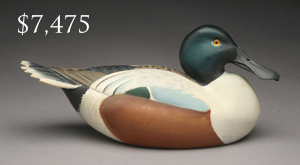 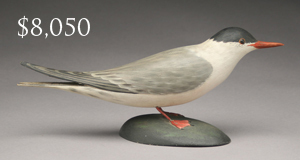 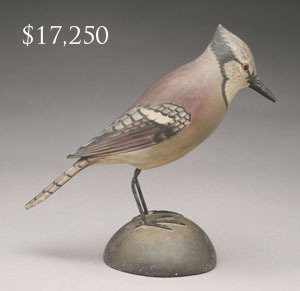 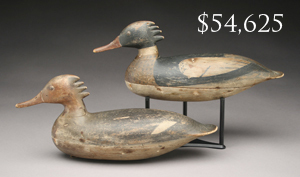 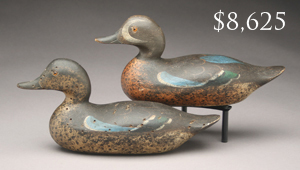 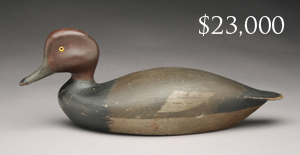 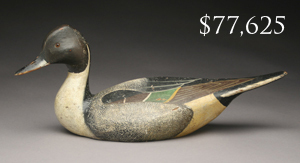 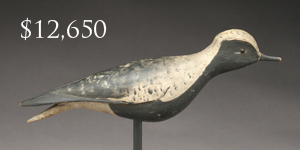 This summer’s sale featured decoys from the collections of William Grossman, the Megargee Family, Doug Knight, Jim Rose, Harry Seitz, Paul Kelly, Peter Bartlett, Phil Stanton, Nancy Prince, Don Beverly, Carl Pryor and Ellery Clark. 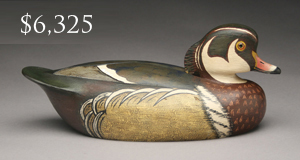 The reputation of Guyette and Deeter, as well as our over 30 years in business, have been the key to our success in securing early collections, many of which have been uncirculated for thirty to forty years. 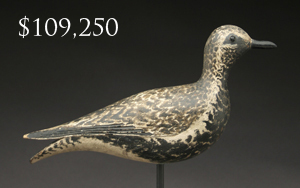 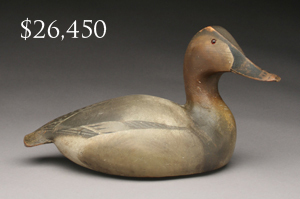 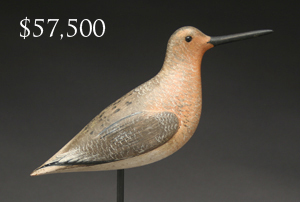 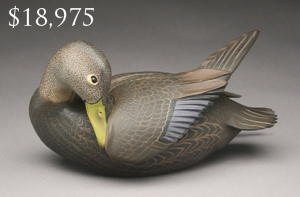 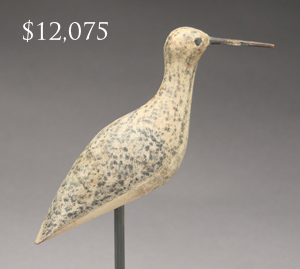 The sale featured decoys by world famous carvers such as Elmer Crowell, Ward Brothers, Harry V. Shourds, Ira Hudson and Charles Perdew will be sold with prices ranging from $300 to over $100,000. 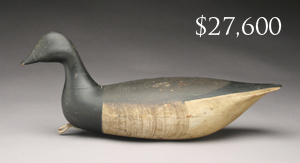 Many New England decoys will be sold including examples by Elmer Crowell (E. Harwich, MA), Gus Wilson (S. Portland, ME), George Boyd (Seabrook, NH) and Joseph Lincoln (Hingham, MA). 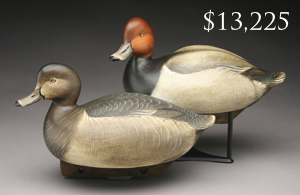 Guyette & Deeter’s next decoy sale will be held November 12 & 13 in Easton, Maryland. 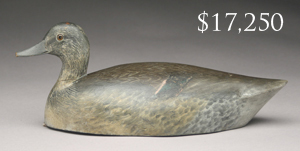 This auction will be held in conjunction with the Easton Waterfowl Festival.